Time to be creative! An abstract 3D Prezi presentation template with a multimedia concept. Various internet and online related objects flying out an ipad screen. 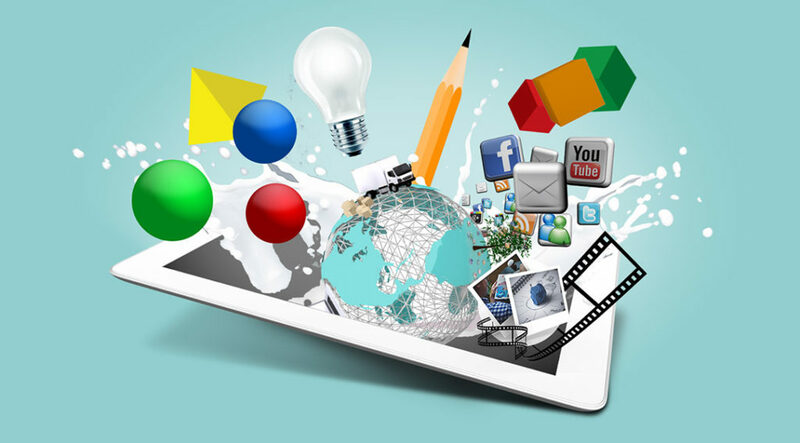 Present about your design agency business or creative multimedia project. Template includes many basic pre-designed elements for content: timeline, world map, image gallery, team page etc… Don’t just click through the slides – take full benefit of Prezi Next. Point with your mouse and scroll into any topic you want, don’t make a linear presentation. Want to present your slides using a creative design? 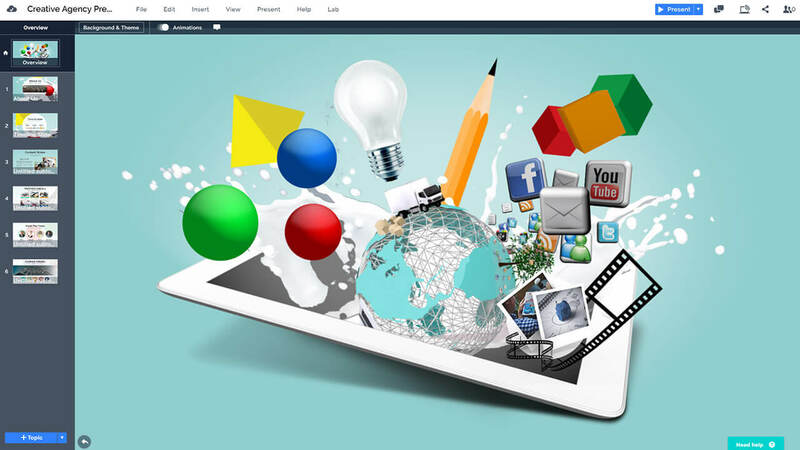 Here’s your chance by using this 3D Prezi presentation template featuring a white tablet computer and a world of multimedia filled with colorful shapes, social media icons, polaroid pictures and a lot more items popping out from the screen. A good template for a web design company or advertisement agency to present about their work and portfolio. Zoom into the shapes which turn into content slides. Watch the live demo on the template page to getter feel and look of how the presentation works and how great the transition effects are. Template includes various business related elements like features list, timeline,gallery, company and team introduction etc. Use the example slides or replace them with your own content. 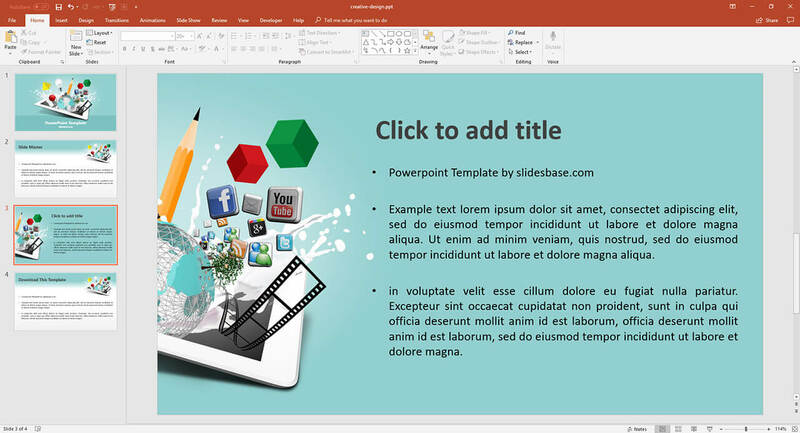 A PowerPoint PPT presentation version of the Creative Design Agency template is included if you wish to skip Prezi altogether. A 16:9 screen ratio template with 2 alternative slide design layouts that will make your multimedia and design related topic really pop out. An abstract multimedia iPad with overflowing digital content. This entry was posted in Best Prezi presentation templates, Prezi Next Templates and tagged abstract 3d media presentation, abstract 3D technology, ad agency presentation ppt, advertising agency pitch presentation ppt, advertising agency ppt presentation, agency presentation, agency presentation deck, creative agency presentation, creative media, dessign agency, digital agency presentation, internet, ipad, marketing agency presentation, multimedia presentation, multimedia template, online, present agency, presentation 3d multimedia, presentation design agency, prezi 3D gallery media, prezi next template, prezi next templates, SEO, social media.